Cool granite, extravagant-looking marble, or virtually any other type of natural stone can be used to improve or complete the look of exterior building facades, retail storefronts, elevator interiors, flooring, and more. As a designer or other construction professional, one of the most important decisions you will have to make before you finalize your plans for a project is what type of natural stone material to use. Will you stick with traditional building materials and opt for solid stone, or will you give StonePly a try? The following points describe some of the similarities and differences between these two aesthetically appealing choices. Solid stone cladding weighs approximately 27 pounds per square foot. StonePly cladding weighs between 2.5 and 3.3 pounds per square foot. A solid stone panel measuring four feet by four feet will weigh in at approximately 432 pounds. A StonePly panel of the same size will weigh about 54 pounds at most. With an impact resistance of 1,500 foot pounds or 3,200 foot pounds, the maximum impact strength of StonePly panels is more than 50 times that of traditional cladding. 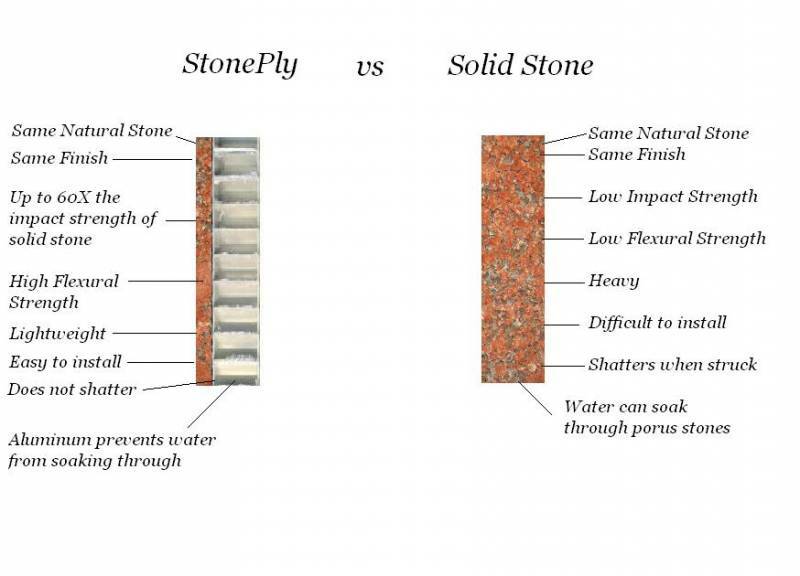 The flexural strength of StonePly panels is superior to that of solid stone cladding. Unlike natural stone cladding, StonePly panels will not shatter. A major upside of using natural stone is just how many looks, patterns, and colors are available. From deep black onyx to gleaming white marble with pink veining to complexly patterned granite, there are literally thousands of choices. Since StonePly is a thin layer of authentic natural stone attached to a substrate, the number of possible design variations is the same. Finally, solid stone panels are unyielding, whereas StonePly panels are flexible. This means they can be used to cover flat surfaces, to create column wraps, and as a cladding for curved and rounded facades. If you’re unfamiliar with our lightweight stone panels and our company, visit the StonePly website. It contains an overview of our consulting services, technical bulletins for our product, and photographs and descriptions of some of our most popular options. To arrange for a consultation and a no-charge personal quote, call us at 903-454-4630 or fill out the short form on our contact page.